In this method, we are laying each match in our accumulator, one by one, and hoping that just one team loses so we receive the free bet! It is important to note that each team in our accumulator must start after the previous team has finished. For a £25 accumulator bet, you will lose on £3.50 as a trigger bet loss but you will have a 40% chance of receiving a £25 free bet. Time Consuming - You need to place a lay bet before each game kicks off if your teams keep winning. Less Profitable - You have less low odds teams to choose from, as you can't pick two teams that are playing concurrently. If you are interested in this Method due to the lower risk, I would recommend Method 4 Lay Sequential Lock In, which is simply a better version of Method 3, Lay Sequential! But I wanted to cover Method 3 to show you how it works given you will see it in the OddsMonkey Acca Matcher and it is a common question. Note this assumes a 10% difference between your back & lay odds e.g. 1.3 back odds and 1.33 lay odds, which gives a £3.50 trigger bet loss. If your acca is showing a lower/higher trigger bet loss, then you will make more/less profit! We are placing a lay bet before each game if our teams keep winning. As soon as 1 team loses, we do not continue to lay the remaining teams and just hope they win, meaning we receive the free bet. We do incur a small trigger bet loss, due to the difference between the back and lay odds. How Much To Lay On Each Team? Our lay stake increases with each team. This is because of the nature of an accumulator bet, which rolls the winnings on to the next game. For example, let's say our £25 accumulator have bookmaker odds of 1.2, 1.3, 1.25, 1.3 and 1.35. If our first team wins, then the back stake for second match has increased to £25 x 1.2 = £30. Therefore, in effect our back stake for our second match is £30, not £25. This means that should our first 4 teams win, the back stake for the fifth match has increased to £25 x 1.2 x 1.3 x 1.25 x 1.3 = £63 back stake. 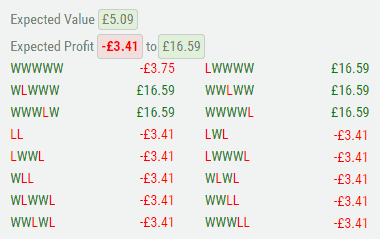 How Is Your Trigger Bet Loss Calculated? As with all trigger bets, the closer your back & lay odds, the smaller your trigger bet loss. Chance Of Each Outcome Happening? 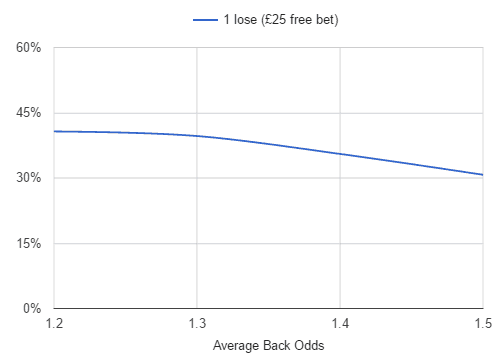 You have a 40% chance of one team losing (and receiving a free bet), this gradually declines as your average back odds increase, as shown in the graph. You will need sufficient balance in your Exchange to cover the amount of your accumulator winnings. For example, if your £25 accumulator has average back odds of 1.3, which is 3.71 combined odds, then you stand to £68. The calculation for this is £25 * (3.71 - 1) on the bookmaker. Time Consuming - You need to be at your laptop (and remember!) to place your lay bet before each match starts. Less Profitable - It is slightly less profitable than Method 1 or Method 2 due to the higher commission. Overall, if you wish to keep your risk to a minimum, I would instead use Method 4 Lay Sequential Lock In, which is very similar but guaranteed a profit with no risk! 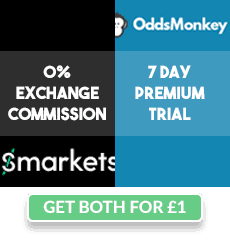 To start profiting from football accumulators using the Lay Sequential Accumulators method, check out the OddsMonkey Acca Matcher article.